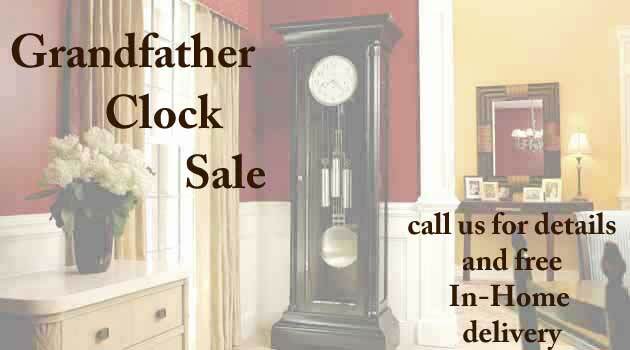 Grandfather Clocks at the lowest prices allowed online. Visit our new Grandfather Clock Outlet Showroom at 3400 Westgate Dr, Durham, N.C. 27707 for New Grandfather Clocks at discount prices. 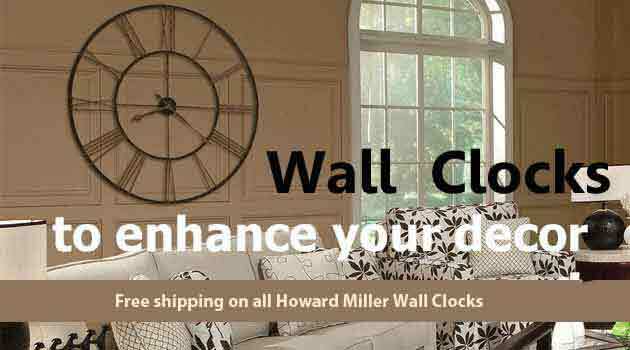 Whether you are a local or online shopper, this is the place to buy Howard Miller Clocks. We offer all popular Grandfather Clock styles and finishes to match any decor. Ridgeway Grandfather clocks are also available which include all of their new and unique styles. Click here to view all Grandfather Clocks for sale or see our informative Grandfather Clock Buyers Guide. 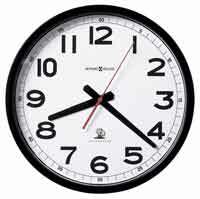 We also publish clock resources and clock help files for many brands and models. We have been a Premier Howard Miller Authorized Dealer for over a decade and your factory warranties are sound with us. Thank you for visiting and please browse around at the vast selection we offer. A new grandfather clock is the perfect heirloom gift. You won't find lower prices for these clocks on the Internet! 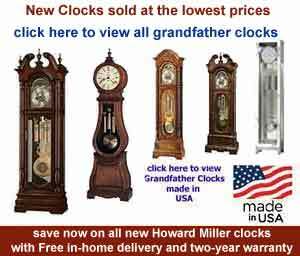 Traditional styles and finishes and new offerings of Quartz grandfather Clocks, Curio grandfather clocks Grandmother Clocks. New styles including Modern, Shaker and Mission Style Clocks are now available. Our collection of contemporary grandfather clocks has caught the attention of many designers or browse our site for all categories and we will do our best to serve your needs. Order Your Grandfather Clock Now! Just imagine the clock chiming. That sound is what turns a house into a home with the warmth of its resonance with our German Grandfather Clock movements. With your eyes you will enjoy the visual appeal of our clocks, whether it is the richness of solid brass, the elegance of rare burls, the reflection of beveled glass or the interest of meticulous carving. Your new Howard Miller Grandfather Clock can be delivered anywhere within cont. United States. All wood cases and genuine lacquer finishes applied by craftsman from the Dutch country in Holland and Zeeland Michigan. A unique, personal furnishing that is built to be enjoyed not only by you, but your children and children's children. 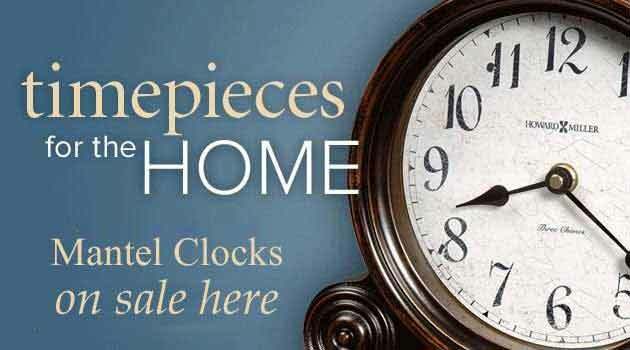 Wall Clocks, Mantel Clocks, Desk Clocks and Gift Ideas are all here! Give the perfect anniversary gift, wedding gift, birthday gift, personalized gift for that personal gift seen everyday, year round. We even have a page especially for corporate gifts and ideas from Hermle Clocks and Howard Miller Clocks. Visit our new selection of Wine Cabinets. See our clock pages on Pinterest. 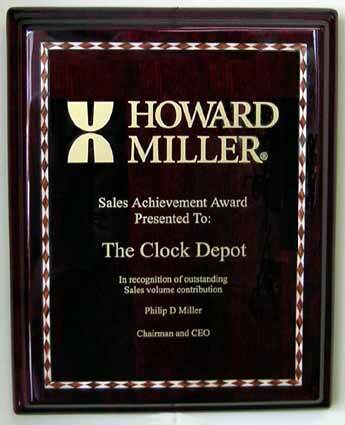 You can find Howard Miller Curio cabinets, home and office wall clocks, Seiko Musical Clocks, Howard Miller Mantel clocks, Alarm Clocks, Travel Alarm Clocks, tide clocks, nautical and weather and maritime clocks, wrought iron clocks, chiming clocks, tabletop clocks, picture frame clocks and desk clocks. 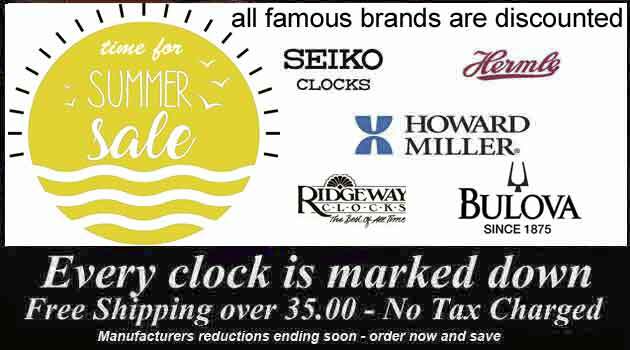 All of our clocks are on sale...not today only, but for the entire month. 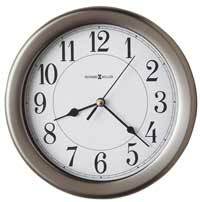 Quartz, Battery operated Mantel Clocks - accurate time with both chiming and non-chiming models. Keywound Mantel Clocks - mechanical movements that need to be wound once per week. Contemporary Mantel Clocks - new modern, contemporary styles never seen before in mantel clocks. Desk and Table Clocks - when space is at a premium, consider a table clock as these are much smaller. We promise to provide quality products and the best service possible.